Chief Jack Cauley was sworn in Jan. 3, 2012. Cauley began his law enforcement career in 1984, as a dispatcher with the Lenexa (Kan.) Police Department. In 1986, he became employed by the Overland Park Police Department as a patrol officer. He continued with the department, moving from officer to detective in the Crimes against Property Unit. In 1991, he was promoted to sergeant, serving the Patrol, Operational Support and Investigation divisions. His duties included investigator and officer-in-charge for the Kansas City metropolitan area’s Metro Squad. He also was a member of Overland Park’s tactical team. In 1996, Cauley was promoted to lieutenant. He served in the Patrol and Administration divisions, working as the emergency management coordinator. In 2001, he was promoted to captain and became commander of the Traffic and Support Division. During his tenure in this division, Cauley's rank was changed in 2002 to major. As major, he became the division commander in Patrol, Investigations and Emergency Services. 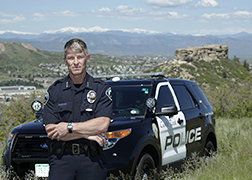 In 2007, Cauley was promoted to lieutenant colonel and was assigned to the Operations Bureau, where he was responsible for the Patrol, Patrol Support and Tactical Operations divisions. He was later assigned to the Services Bureau, where he was responsible for investigations, dispatch, crime analysis, records and property, professional standards, personnel and hiring. Chief Cauley holds a bachelor’s degree in criminal justice administration from Central Missouri State University and a master’s degree in public administration from the University of Kansas. He also is a graduate of the FBI National Academy.